Make it a deluxe! The seat height is adjustable with a pneumatic lift for counter, table and desk applications to make all your work easier. It features a fully articulating seat and back clutch mechanism with one lever control. Welded steel 5-star base with telescoping polypropylene cover and floor glides. Paddle lever controls 10° seat tilt and 22° backrest tilt. Ergo knob controls 5" backrest height adjustment. 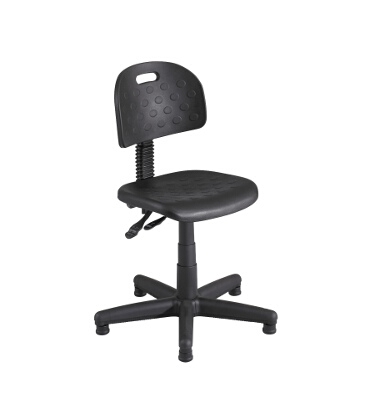 Solid molded self-skinned polyurethane seat and back in Black. Some assembly required.